Suzuki has revealed its European Swift model, which goes on sale this summer with increased boot space and improved fuel economy and emissions. New Swift is 120kg lighter than the outgoing model, thanks to the ‘Heartect’ platform. Available as a five-door model only in line with market trends, the new Swift joins the Baleno and Ignis in adopting the new ‘Heartect’ platform. Thanks to its light yet rigid construction, the platform is 30kg lighter than before, helping lead to a weight reduction of up to 120kg for the Swift. 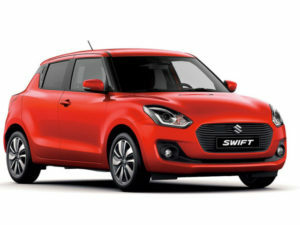 The new Swift is also shorter, lower and wider than before, while bringing a 20mm longer wheelbase that offers increased passenger space plus an extra 54 litres of boot space, which stands at 254 litres. The petrol only engine line-up sees the debut of the 109bhp 1.0-litre three cylinder Boosterjet petrol, also featured in the Baleno and S-Cross, which offers CO2 emissions of 104g/km and 61.4mpg for the manual transmission model. The Boosterjet engine is available for the first time with Suzuki’s SHVS (Smart Hybrid Vehicle by Suzuki) mild hybrid system offering CO2 emissions of 97g/km. An 89bhp 1.2-litre four cylinder Dualjet engine will also be available, offering CO2 emissions of 98g/km and 65.7mpg for manual transmission model. This engine is also available with Suzuki’s ALLGRIP ‘AUTO’ four-wheel drive system as an option – fuel and CO2 figures haven’t been released for this model yet. Three trims will be offered: SZ3, SZ-T and SZ5 grades. The SZ3 model, which comes with 1.2-litre Dualjet engine and manual transmission, brings air conditioning, leather steering wheel, DAB radio with Bluetooth and four speakers, LED daytime running lights, 15-inch wheels, body coloured door mirrors and front electric windows. The SZ-T model is available with the 1.0-litre Boosterjet engine and manual transmission and adds rear view camera, Smartphone link display audio, 16-inch alloy wheels and front fog lamps glass. SZ5 adds auto air conditioning, 16-inch polished alloy wheels, satellite navigation, keyless entry and start and rear electric windows and a 4.2 inch high-definition colour LCD display. The SZ5 also debuts Suzuki’s advanced forward detection system, which uses cameras and lasers to provide autonomous emergency braking, lane departure warning and high beam assist along with adaptive cruise control. This is also available with the Dual Sensor Brake Support (DSBS) autonomous emergency braking system on the SZ5 grade. The all new Swift goes on sale in the UK on 1 June 2017, with pricing to be announced in May. For more highlights from Geneva Motor Show, click here.